You can have the gazebo design and build tailored to your needs. If you want a classic design of a rounded gazebo with an octagonal roof, that’s fine. But now you are given the chance to think out of the box and have yours customized exactly the way you like it. Let us just say that wood is always a good option for gazebo construction. Why? You can order a custom gazebo in any wood type. No need to keep the natural wood tone. You can paint wood the color you like. Wood is friendly to the environment because it comes from it. In other words, it will blend right in the natural landscape. Wood goes well with metal. And so you come up with all sort of gazebo ideas by using both materials. This blend will make the gazebo’s looks more contemporary. If stained properly, wood can last for many, many years. Yes, it needs maintenance but so will any other material. Who said that gazebos don’t match with outdoor decking? Whether you choose the same or different woods, the results will be stunning. To make the construction modern, avoid building a wooden roof. Let a fabric play the part of the roof and just use wooden beams. Ask your gazebo builder to paint wood white. This is a bold color that will stand out and make the construction contemporary. 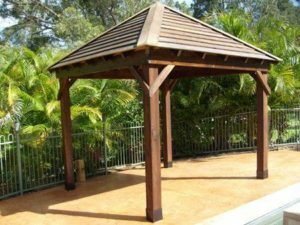 One of the things, which make classic gazebos traditional is the natural wood color. Paint it white and you will get the modern results you seek. 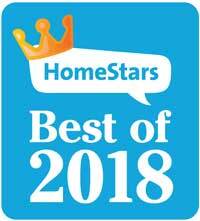 If you like to have a roof and thus get all the benefits gazebos offer – sun protection, rain protection, and shade – it’s not necessary to order them in octagonal shape. Make them flat for a change. This different shape will alter their character, making them modern. Opt for a simple construction with four regular pillars and beams or a regular roof or ask your gazebo contractor to help you design an even more extravagant construction. The former will be minimal. But a modern design might have beams protruding, sunscreens, crossed beams, and curtains on the sides. 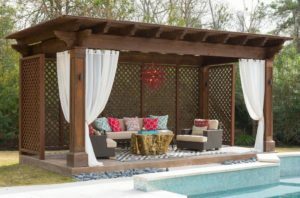 Your wood gazebo will serve as the place to relax, have dinner with the family, invite friends, and throw parties. And so our advice is to think of various designs without disregarding function. If you intend to spend some time there, create the right environment. Order custom decks if you intend to put a table. Let the roof be beamed if you want to gaze at the sky. In other words, let your needs guide you and as for ideas, there are as many as the stars in the sky.